In the early hours of Wednesday, January 12, Pete Johnson loaded up the truck on his Craftsbury farm, Pete’s Greens, that would deliver Good Eats CSA shares all over Vermont. At 3 a.m., he returned to bed — only to be woken by a boom at about 4:20. His barn was on fire. The noise was caused by pieces of the building that were collapsing in the blaze. So Pete’s Greens is reaching out to members and friends. 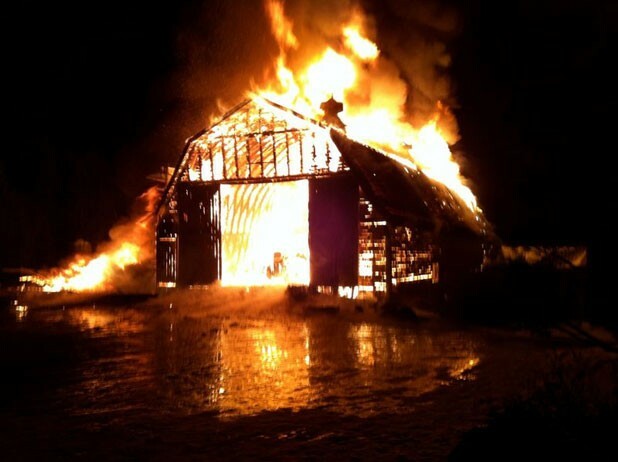 Its website now features links to a page with more information about the fire and to PayPal, which folks can use to pledge any amount to help rebuild the barn and replace equipment lost in the blaze. Burlington’s Jordan Silverman Photography is selling photos of the farm and of Pete Johnson himself. All money raised will go directly to Pete’s Greens. The United Church of Craftsbury, the Art House and Stardust Books & Café; will hold a benefit supper and art sale on Wednesday, January 19, at 6 p.m. at the church in Craftsbury Common. All proceeds will go to Pete’s Greens. Juniper’s Restaurant in Lyndonville will donate 25 percent of the proceeds from its Thursday, January 20, localvore dinner to the farm. The Mad River Valley Localvore Project will host its “Bid for the Barn” silent auction from January 23 through 30. Available items include a chef’s-table tasting at Hen of the Wood at the Grist Mill. Craftsbury Outdoor Center will host a BKL ski race in Johnson’s honor at 10 a.m. on Saturday, January 22. All locations of American Flatbread will donate a percentage of their January 27 sales to the farm. Applecheek Farm will serve a benefit dinner on February 4. For fundraising and recovery updates, check petesgreens.com.